On public transport, there’s an unspoken rule to not take the seat next to someone if there are other seats available. In especially longer public transport commutes, the entire ride can be done in silence with people keeping to themselves. But why is this? And what does it say about the way we interact with others in public spaces? My research study on long-distance commuter buses pointed to some possible answers. In my bus travel study, published recently in Symbolic Interaction, I found people make active effort to avoid others by privatising public spaces. There were various ways in which people formed an invisible bubble around them. Their greatest task was to prevent strangers from bursting their invisible bubble; in this case, to prevent others from sitting next to them. For more than two years, I hopped on long-distance commuter buses and jotted detailed notes about the buses, the people, and bus terminals. I didn’t have any agenda in mind because I didn’t want to jump to any conclusions. After a few long exasperating trips, I began to think I wasn’t getting anywhere with the project because nothing seemed to be going on. I continued to take rides across the United States hoping to see more action. But routinely, one-by-one passengers got on the bus, one-by-one they sat in empty seats, and one-by-one they got off the bus. Most of the journeys had been quiet and uneventful. So it seemed. Upon reviewing my field notes, I realised that I had been misinterpreting the silence. In fact, there was a lot of action taking place. In my observation, there were several reasons why passengers on long commute buses avoid social contact with others. First is the uncertainty about strangers. While Greyhound buses in the past have been a common mode of transportation for people from all kinds of backgrounds, today it is stigmatised as a dangerous option. 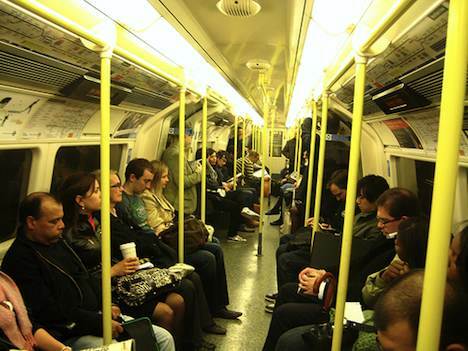 To prevent potential dangers, passengers opt to avoid others altogether in order to minimise instability. Passengers also avoid other people due to aggravation from bus delays and extended rides, which cause people to be physically and psychologically exhausted. Some passengers gave me hints on how to disengage with the public world around you. During those rides, I also found myself exhibiting nonsocial behaviours by becoming an expert “private space maker”. Little did we know that this was breaching the rules on the bus. By randomly sitting next to strangers when there were other open seats, I am certain I was black-labelled as one of the “weirdos who talk,” according to Manny. In a space where nonsocial behaviour takes place, a certain atmosphere is created, and this in turn shapes the social environment for others who occupy the space. New people who enter the space typically follow established social norms and protocols in order to maintain a coherent social order. Since people respond in accordance to a general atmosphere of a social situation, the cold and avoiding characteristics of nonsocial behaviour is usually met with a similar behavioural response. In other words, people have a mutual understanding: they neither step into other people’s boundaries nor allow others to step into theirs. Examining the nonsocial transient spaces allows us to understand what occurs during periods when strangers are together for long stretches of time. While avoiding potential danger is important, what’s troubling about nonsocial transient behaviour is that these behaviours may trickle into our everyday lives. Esther Kim does not work for, consult to, own shares in or receive funding from any company or organisation that would benefit from this article, and has no relevant affiliations. It is very complicated. But has a lot to do with talking to strangers. Friends often talk to each other on public transport, school kids always do. I was one of those kids. I talk to people on long journeys and have met many interesting people while traveling from place to place. But usually the amount of time is much longer and the travel itself makes for a common point to start from. On your daily commute often one wants to just have a bit of a rest and traveling provides the opportunity to do this. I’ve also noticed that people tend to talk on public transport in some cities more than others, and the time of day and week tends to matter as well. People tend to talk and smile more on Friday for instance; less so on Monday mornings. Funny that.